Germanwings Flight 9525[a] was a scheduled international passenger flight from Barcelona–El Prat Airport in Spain to Düsseldorf Airport in Germany. The flight was operated by Germanwings, a low-cost carrier owned by the German airline Lufthansa. On 24 March 2015, the aircraft, an Airbus A320-211, crashed 100 kilometres (62 mi) north-west of Nice in the French Alps. All 144 passengers and six crew members were killed. It was Germanwings' first fatal crash in the 18-year history of the company. The investigation determined that the crash was caused deliberately by the co-pilot, Andreas Lubitz, who had previously been treated for suicidal tendencies and declared "unfit to work" by his doctor. Lubitz kept this information from his employer and instead reported for duty. Shortly after reaching cruise altitude and while the captain was out of the cockpit, he locked the cockpit door and initiated a controlled descent that continued until the aircraft impacted a mountainside. In response to the incident and the circumstances of the co-pilot's involvement, aviation authorities in some countries implemented new regulations that require the presence of two authorized personnel in the cockpit at all times. Three days after the incident, the European Aviation Safety Agency issued a temporary recommendation for airlines to ensure that at least two crew members—including at least one pilot—were in the cockpit for the entire duration of the flight. Several airlines announced that they had already adopted similar policies voluntarily. 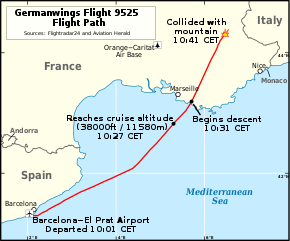 Germanwings Flight 9525 took off from Runway 07R at Barcelona–El Prat Airport on 24 March 2015 at 10:01 a.m. CET (09:01 UTC) and was due to arrive at Düsseldorf Airport by 11:39 CET. The flight's scheduled departure time was 9:35 CET. According to the French national civil aviation inquiries bureau, the Bureau of Enquiry and Analysis for Civil Aviation Safety (BEA), the pilots confirmed instructions from French air traffic control at 10:30 CET. At 10:31 CET, after crossing the French coast near Toulon, the aircraft left its assigned cruising altitude of 38,000 feet (12,000 m) and without approval began to descend rapidly. The air traffic controller declared the aircraft in distress after its descent and loss of radio contact. The descent time from 38,000 feet was about ten minutes; radar observed an average descent rate of approximately 3,400 feet per minute or 58 feet per second (18 m/s). Attempts by French air traffic control to contact the flight on the assigned radio frequency were not answered. A French military Mirage jet was scrambled from the Orange-Caritat Air Base to intercept the aircraft. According to the BEA, radar contact was lost at 10:40 CET; at the time, the aircraft had descended to 6,175 feet (1,882 m). The aircraft crashed in the remote commune of Prads-Haute-Bléone, 100 kilometres (62 mi) north-west of Nice. A seismological station of the Sismalp network, the Grenoble Observatory, 12 kilometres (7.5 mi) from the crash site, recorded the associated seismic event, determining the crash time as 10:41:05 CET. The crash is the deadliest air disaster in France since the 1981 crash of Inex-Adria Aviopromet Flight 1308 in which 180 people died, and the third-deadliest French air disaster of all time, behind Flight 1308 and Turkish Airlines Flight 981. This was the first major crash of a civil airliner in France since the crash of Air France Flight 4590 on takeoff from Charles de Gaulle Airport in 2000. The crash site is within the Massif des Trois-Évêchés, three kilometres (2 mi) east of the settlement Le Vernet and beyond the road to the Col de Mariaud, in an area known as the Ravin du Rosé. 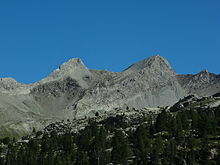 The aircraft crashed on the southern side of the Tête du Travers, a minor peak in the lower western slopes of the Tête de l'Estrop. The site is approximately 10 kilometres (6 mi) west of Mount Cimet, where Air France Flight 178 crashed in 1953. Gendarmerie nationale and Sécurité Civile sent helicopters to locate the wreckage. The aircraft had disintegrated; the largest piece of wreckage was "the size of a car". A helicopter landed near the crash site; its personnel confirmed there were no survivors. The search and rescue team reported the debris field covered two square kilometres (500 acres). The aircraft involved was a 24-year-old Airbus A320-211,[b] serial number 147, registered as D-AIPX. It made its first flight on 29 November 1990 and was delivered to Lufthansa on 5 February 1991. The aircraft was leased to Germanwings from 1 June 2003 until mid-2004, then returned to Lufthansa on 22 July 2004 and remained with the airline until it was transferred to Germanwings again on 31 January 2014. The aircraft had accumulated about 58,300 flight hours on 46,700 flights. Some passengers had multiple citizenship. Counts are based on preliminary data and do not total 150. During its final flight, the aircraft was carrying 144 passengers and six crew (two pilots and four cabin crew members) from at least 18 countries—mostly Germany and Spain. The count was confused by the multiple citizenship status of some people on board. The flight's pilot in command was 34-year-old Captain Patrick Sondenheimer, who had ten years of flying experience (6,000 flight hours) flying A320s for Germanwings, Lufthansa, and Condor. The co-pilot was 27-year-old Andreas Lubitz, who joined Germanwings in September 2013 and had 630 flight hours of experience. Andreas Günter Lubitz was born on 18 December 1987 and grew up in Neuburg an der Donau, Bavaria and Montabaur in the German state of Rhineland-Palatinate. He took flying lessons at Luftsportclub Westerwald, an aviation sports club in Montabaur. Lubitz was accepted into a Lufthansa trainee programme after finishing high school. In September 2008, he began training at the Lufthansa Flight Training school in Bremen, Germany. He suspended his pilot training in November 2008 after being hospitalized for a severe episode of depression. After his psychiatrist determined that the depressive episode was fully resolved, Lubitz returned to the Lufthansa Flight Training school in August 2009. Lubitz moved to the United States in November 2010 to continue training at the Lufthansa Airline Training Center in Goodyear, Arizona. From June 2011 to December 2013, he worked as a flight attendant for Lufthansa while training to obtain his commercial pilot's licence, until joining Germanwings as a first officer in June 2014. Among the passengers were sixteen students and two teachers from the Joseph-König-Gymnasium of Haltern am See, North Rhine-Westphalia. They were returning home from a student exchange with the Giola Institute in Llinars del Vallès, Barcelona. Haltern's mayor, Bodo Klimpel, described the crash as "the darkest day in the history of [the] town". Bass-baritone Oleg Bryjak and contralto Maria Radner, singers with Deutsche Oper am Rhein, were also on the flight. The French Bureau of Enquiry and Analysis for Civil Aviation Safety (BEA) opened an investigation into the crash; it was joined by its German counterpart, the Federal Bureau of Aircraft Accident Investigation (BFU). The BEA was assisted by the United States Federal Bureau of Investigation (FBI). Hours after the crash, the BEA sent seven investigators to the crash site; these were accompanied by representatives from Airbus and CFM International. The cockpit voice recorder, which was damaged but still usable, was recovered by rescue workers and was examined by the investigation team. The following week, Brice Robin, the government prosecutor based in Marseille, announced that the flight data recorder, which was blackened by fire but still usable, had also been found. Investigators isolated 150 sets of DNA, which were compared with the DNA of the victims' families. According to French and German prosecutors, the crash was deliberately caused by the co-pilot, Andreas Lubitz. Brice Robin said Lubitz was initially courteous to Captain Sondenheimer during the first part of the flight, then became "curt" when the captain began the mid-flight briefing on the planned landing. Robin said when the captain returned from probably using the toilet and tried to enter the cockpit, Lubitz had locked the door. The captain had a code to unlock the door, but the lock's code panel can be disabled from the cockpit controls. The captain requested re-entry using the intercom; he knocked and then banged on the door, but received no response. The captain then tried to break down the door, but like most cockpit doors made after the September 11 attacks, it had been reinforced to prevent intrusion. During the descent, the co-pilot did not respond to questions from air traffic control and did not transmit a distress call. 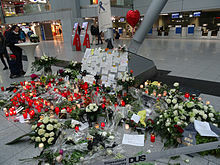 Robin said contact from the Marseille air traffic control tower, the captain's attempts to break in, and Lubitz's steady breathing were audible on the cockpit voice recording. The screams of passengers in the last moments before impact were also heard on the recording. After their initial analysis of the aircraft's flight data recorder, the BEA concluded that Lubitz deliberately crashed the aircraft. He had set the autopilot to descend to 100 feet (30 m) and accelerated the speed of the descending aircraft several times thereafter. The aircraft was travelling at 700 kilometres per hour (430 mph) when it crashed into the mountain. The BEA preliminary report into the crash was published on 6 May 2015, six weeks later. It confirmed the initial analysis of the aircraft's flight data recorder and revealed that during the earlier outbound Flight 9524 from Düsseldorf to Barcelona, Lubitz had practised setting the autopilot altitude dial to 100 feet several times while the captain was out of the cockpit. Three days after the crash, German detectives searched Lubitz's Montabaur properties and removed a computer and other items for testing. They did not find a suicide note nor any evidence his actions had been motivated by "a political or religious background". During their search of Lubitz's apartment, detectives found a letter in a waste bin indicating he had been declared unfit to work by a doctor. Germanwings stated it had not received a sick note from Lubitz for the day of the flight. News accounts said Lubitz was "hiding an illness from his employers"; under German law, employers do not have access to employees' medical records, and sick notes excusing a person from work do not give information about medical conditions. The following day, authorities again searched Lubitz's home, where they found evidence he was taking prescription drugs and suffered from a psychosomatic illness. Criminal investigators said Lubitz's web searches on his tablet computer in the days leading up to the crash included "ways to commit suicide" and "cockpit doors and their security provisions". Prosecutor Brice Robin said doctors had told him Lubitz should not have been flying, but medical secrecy requirements prevented this information from being made available to Germanwings. In the weeks before the BEA's preliminary report, the investigation into Lubitz found he had been treated for suicidal tendencies prior to his training as a commercial pilot and had been temporarily denied a US pilot's license because of these treatments for depression. The final report of the BEA confirmed the preliminary report's findings, saying the co-pilot began showing symptoms of psychotic depression. [f] For five years, Lubitz had frequently been unable to sleep because of what he believed were vision problems; he consulted over forty doctors and feared he was going blind. Motivated by the fear that blindness would cause him to lose his pilot's licence, he began conducting online research about methods of committing suicide before deciding to crash Flight 9525. French Minister of the Interior Bernard Cazeneuve announced that due to the "violence of the impact" there was "little hope" any survivors would be found. Then Prime Minister Manuel Valls dispatched Cazeneuve to the scene and set up a ministerial task force to coordinate the response to the incident. German Foreign Minister Frank-Walter Steinmeier flew over the crash site; he described it as "a picture of horror". German Chancellor Angela Merkel and the minister-president of North Rhine-Westphalia Hannelore Kraft travelled to the crash site the following day. Merkel, Valls, and Spanish Prime Minister Mariano Rajoy visited the recovery operations base at Seyne-les-Alpes. Bodo Klimpel, mayor of Haltern am See, reacting to the deaths of sixteen students and two teachers from the town, said that people were shocked by the crash. Lufthansa chief executive officer Carsten Spohr visited the crash location the day following the crash; he said it was "the darkest day for Lufthansa in its 60-year history". 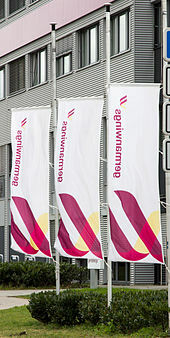 Several Germanwings flights were cancelled on 24 and 25 March due to the pilots' grief at the loss of their colleagues. Germanwings retired the flight number 4U9525, changing it to 4U9441; the outbound flight number was changed from 4U9524 to 4U9440. In the days following the crash, Lufthansa at first said it saw no reason to change its procedures, then reversed its earlier statement by introducing a new policy across its airlines requiring the presence of two crew members in the cockpit at all times. In response to the incident and the circumstances of Lubitz's involvement in it, aviation authorities in some countries (including Australia, Canada, Germany and New Zealand) implemented new regulations that require two authorized personnel to be present in the cockpit of large passenger aircraft at all times. While the United States Federal Aviation Administration,[g] the Civil Aviation Administration of China[h] and some European airlines already had a similar "rule of two" requirement, the European Aviation Safety Agency recommended the introduction of similar legal changes. Other airlines announced similar changes to their policies. The British Psychological Society issued a statement offering to provide expert support in psychological testing and monitoring of pilots. The European Federation of Psychologists' Associations (EFPA) issued a statement supporting psychological testing in the selection of pilots, but also stated it could not forecast the life events and mental health problems of individual pilots, nor could it predict the unique ways pilots would cope with these. It said priority should be given to psychological help for relatives and friends of victims in the aftermath of a disaster. Lufthansa CEO Carsten Spohr proposed random checks of pilots' psychological fitness and a loosening of the extant physician–patient confidentiality laws. Politicians began echoing the call for a loosening of the laws in exceptional cases. The National Gendarmerie, a national police force in France that prides itself on toughness and resilience, introduced a new set of support mechanisms to minimize the psychosocial risks to relief workers who deal with events such as Flight 9525 in their daily jobs. Germanwings' parent company Lufthansa offered victims' families an initial aid payment of up to €50,000, separate from any legally-required compensation for the disaster. Elmar Giemulla, a professor of aviation law at the Technical University of Berlin quoted by the Rheinische Post, said he expected the airline would pay €10–30 million in compensation. The Montreal Convention sets a per-victim cap of €143,000 in the event an airline is held liable, unless negligence can be proven. Insurance specialists said although co-pilot Andreas Lubitz hid a serious illness from his employer and deliberately crashed the passenger aircraft, these facts would not affect the issue of compensation nor be applicable to the exclusion clause in Lufthansa's insurance policy. Lufthansa's insurance company set aside US$300 million (€280 million) for financial compensation to victims' families and for the cost of the aircraft. As of February 2017, Lufthansa had paid €75,000 to every family of a victim as well as €10,000 pain and suffering compensation to every close relative of a victim. A lawyer for the families was preparing a lawsuit in Germany to extract higher compensation. German law does not allow for punitive damages or the broad discovery generally available under the law of most American jurisdictions. A U.S. plaintiffs' law firm, Kreindler & Kreindler, signed up families of about 80 of the crash victims as clients; and filed a lawsuit on their behalf on 13 April 2016 in the United States District Court for the District of Arizona against the Arizona-based Lufthansa Airline Training Center that Lubitz had attended for his training as a commercial pilot. Shortly after the crash, a memorial stone in memory of the victims was erected near the crash site in Le Vernet. The following month, about 1,400 relatives of victims, senior politicians, rescue workers, and airline employees attended a memorial service at Cologne Cathedral. The parents of Andreas Lubitz were invited to the service but did not attend. The remains of fifteen of the sixteen school children and their two teachers arrived in their home town of Haltern for burial two months after the crash. Residents held white roses as the hearses passed the children's school, where eighteen trees—one for each victim—had been planted as a memorial. In Düsseldorf on the same day, the remains of forty-four of the seventy-two German victims arrived for burial. Errors on the victims' death certificates had caused a delay. A lawyer representing the families of thirty-four victims said that burying the remains would help many relatives achieve closure. The Lubitz family held a press conference on 24 March 2017, two years after the crash. Lubitz's father said that they did not accept the official investigative findings that Andreas Lubitz deliberately caused the crash or that he had been depressed at the time. They presented aviation journalist Tim van Beveren, whom they had commissioned to publish a new report, which asserted that Lubitz could have fallen unconscious, that the cockpit door lock had malfunctioned on previous flights, and that potentially dangerous turbulence had been reported in the area on the day of the crash. The timing of the press conference by Lubitz's father, on the anniversary of the crash, was criticized by families of the victims, who were holding their own remembrances on that day. The crash was dramatised in season 16 of the Canadian TV series Mayday in an episode entitled "Murder in the Skies". The episode aired on 24 January 2017. This page is based on the Wikipedia article Germanwings Flight 9525; it is used under the Creative Commons Attribution-ShareAlike 3.0 Unported License (CC-BY-SA). You may redistribute it, verbatim or modified, providing that you comply with the terms of the CC-BY-SA.